Are you planning a trip to Bryce Canyon National Park and wondering what to pack? It can be tricky knowing what to take with you when you visit a National Park. This is especially true when it comes to knowing what to pack for Bryce Canyon National Park. Bryce Canyon is at a high elevation and so it can get pretty chilly no matter what time of the year. You should also expect snow from late fall to early spring. But that doesn’t mean there’s no sun. You basically have to pack for two climates! On top of that, there are also extra considerations to bear in mind if you’re hiking in Bryce Canyon National Park. But don’t I’ve put together a packing list for Bryce Canyon National Park that’ll make sure you know what to wear for Bryce Canyon and don’t forget the essentials! Bryce Canyon National Park is situated on a high plateau at the top of the Grand Staircase monument. Bryce Canyon elevation is mostly quite high, there are incredibly dark skies (some of the best we saw!) and impressive hoodoo rock formations. In fact, it’s these rock formations that the park is famous for. Contrary to what the name suggests, Bryce Canyon is not a single canyon. Rather it’s a series of natural amphitheatres or bowls, carved into the edge of a high plateau. The most famous of these is the Bryce Amphitheatre which is full of rock towers called hoodoos. 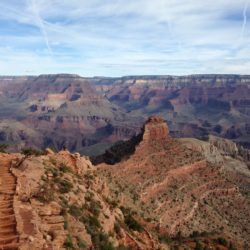 There are four main viewpoints from which to see this area: Bryce Point, Inspiration Point, Sunset Point and Sunrise Point. From January to April temperatures typically range from -12°C – 10°C. Bryce Canyon in May to August range from freezing to the high 20s and September to December in Bryce Canyon can be from -15°C to the mid-20s. You see? The temperature is pretty variable. If you’re visiting Bryce Canyon National Park in the summer months then sun protection is essential. Make sure you pack loose-fitting, light coloured clothing and ideally a hat for your trip to Bryce Canyon National Park. However, if you’re visiting in winter you’ll want plenty of warm layers and protection from possible water and snow. 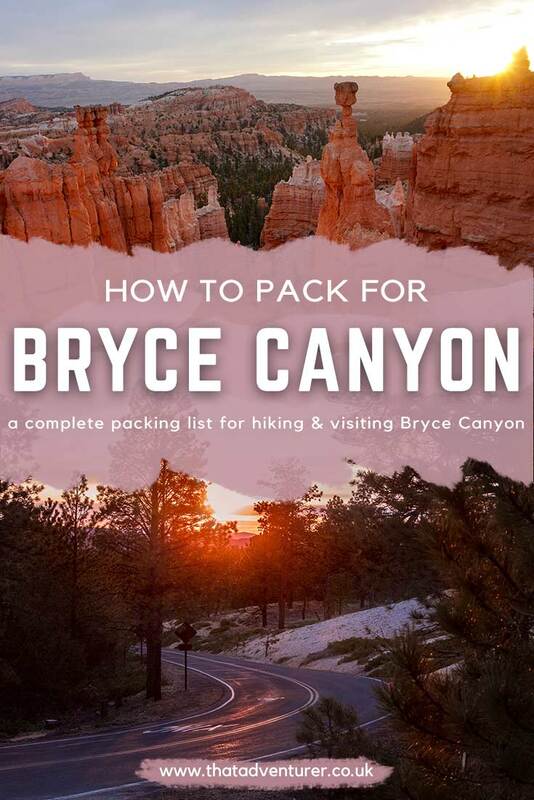 But don’t stress, this Bryce Canyon packing list has everything you’ll need in it so you won’t forget anything! I mean yeah, you can bring your usual underwear, of course, but if you’re planning on hiking a lot and want something a bit more resilient and quick drying then you’ll want to invest in some quick-drying, wicking underwear and a sports bra. If you’re camping or planning to do some sunrise/sunset missions then you might want to pack some base layers with you just so you’re a bit warmer. We were travelling in our van and base layers while sleeping was the best on cold nights! I love these leggings and this top for base layers. You’re going to need some socks but the type you need depends on what you plan on doing. 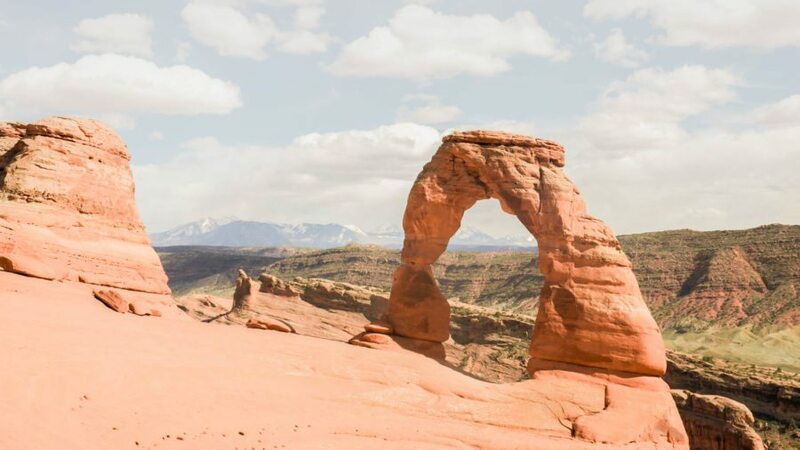 I’d suggest some casual socks that you’d wear every day for when you’re chilling out, or browsing around Moab and then some thicker socks like these for hiking. You’ll want a combination of t-shirts and the amount depends on how long your trip to Bryce Canyon is. I personally prefer long sleeved t-shirts over short sleeved ones. However, if you’re visiting Bryce in the summer make sure you pack some short sleeves or tank tops since it gets hot in the afternoon. Try to avoid cotton and opt for quick drying tees. You’re going to need something to wear on your bottom half too! Bryce Canyon is at a high elevation and so the mornings and evenings can often be quite cold. If you’re hiking in Bryce Canyon at these times you’ll probably want to wear some leggings over shorts. However, if you’re visiting the National Park during the day shorts are going to make you more comfortable. Just remember your sun cream! Even though they’re expensive I love my Lululemon shorts and leggings on hikes. These shorts are longer than most of their range which I much prefer. It doesn’t have to be hooded but you’ll want to make sure you pack an insulated jacket for your Bryce trip. Thom and I both have jackets from The North Face. Mine is this The North Face Thermoball hoody and it’s so warm and cosy. They don’t seem to stock the exact same version anymore, but this one looks like it’s basically the same. I’ve had my eyes on one of these Patagonia fleeces forever. I’ve tried them on and they’re super warm and cosy. Make sure you pack a good outer layer for your trip to Bryce Canyon. Whilst it doesn’t rain a lot in Bryce Canyon it does sometimes and there’s nothing like wet clothes to ruin your experience and Bryce Canyon activities. It’d be a good idea to pack both a waterproof jacket and waterproof pants for your trip to Bryce Canyon National Park. This Marmot rain jacket comes at a good price, gets great reviews and comes in pretty colours. In terms of waterproof pants, Marmot again is a good bet for reasonably priced waterproof gear. These are great as they have toggles around the ankles which stops rain running into your shoes or splashing up on to your leg under the pants. 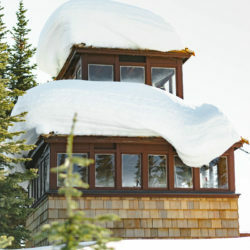 If you think you’ll be spending a lot of time in rainier destinations then invest in a really good Goretex gear. Thom got me an Arc’teryx jacket for my birthday and I love it! Depending on the season you’re going to want a sun-shielding hat, a winter hat or even both if you’re visiting Bryce Canyon in early Spring or late autumn. Add some gloves or mittens to your packing list for Bryce if you’re there in the colder months. I prefer mittens as I swear they keep my hands warmer! These Smartwool ones are so cosy & warm! Buffs are incredibly versatile. They’re good for staying both warm and cool as well as protecting yourself from the sun and the sand or dust. 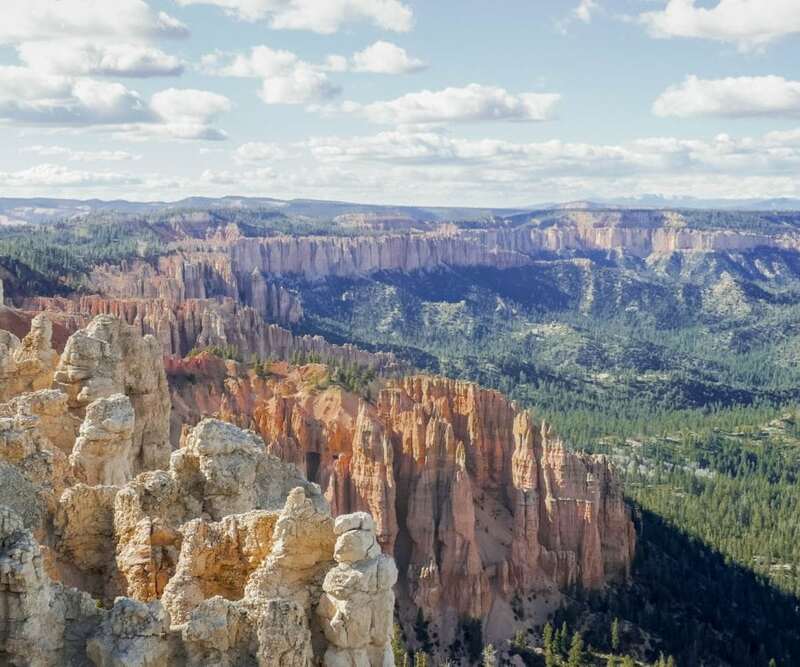 When it comes to packing for Bryce Canyon you’re most likely going to want to pack both hiking shoes with a sturdy and thick sole as well as something more casual. What you take in terms of casual shoes is completely down to preference. I like my Addidas Stan Smiths but you could take some hiking sandals or flipflops for chilling around camp in. With regards to hiking shoes, I love my Keen Terradora (review here) for summer hikes where I’m not carrying a big pack. They’d be perfect for most of the easier and moderate hikes in Bryce Canyon National Park. However, if you’re doing something longer where you’ll be carrying a big pack you’ll probably want something with more ankle support. Besides clothes, you’ll also have to pack some other things to make sure you’re prepared for your trip to Bryce Canyon National Park. Some of these you’ll have already thought of, but others are fun things to pack that’ll just make your trip even more fun! Even on the shortest hikes having a day pack is a good idea. It’s somewhere to store your water and snacks as well as your 10 essentials. I use my Lowe Alpine Aeon backpack all the time – full review here. This is down to preference but just make sure you have plenty of water. Whichever National Park you’re visiting you should aim for about a gallon a day (4 litres) of water if you’re hiking it’ll be even more. Hydration systems are useful because you can drink without having to move anything from your bag. If you’re in the market for a hydration system, this one from Osprey is fantastic since it does not only include the reservoir for the hydration system but is a big 36L day pack too. Personally, I tend to use water bottles like this just out of habit. Plus, if you’re backcountry camping and need to purify your water, then you can have one bottle being purified and another you can drink from. Having some dry bags in your backpack while you’re out hiking in Bryce Canyon National Park is a great idea. You never know when it’s going to rain! I’d recommend some varied sizes, one for your phone and your camera as well as separate, larger one for your clothing layers. Even if you don’t plan on camping or staying in the park after dark it’s important to always have a headlamp with you. You might get distracted watching the sunset and have to hike back to your car and a headlamp is super useful for that! Or, if you’re heading to a ranger talk this will help you get to and from them safely. I like this headlamp (partly ’cause of the colour), but also because it’s super bright, can be dimmed, and doesn’t weigh much at all. If you’re staying in a hotel you may not need to pack a towel but it’s a good idea to have one just in case your motel or hotel near Bryce doesn’t provide them. These ones are very light, pack up small and dry quick! You’ll want these items whether you’re backcountry camping in Bryce Canyon or not. If you are camping then be sure to check out my post on how to stay feeling clean without a shower. It’ll come in handy! Women’s hygiene items – I swear by Diva cups and yes you can totally use them while hiking and camping, they only need wiping and rinsing. Waaay better for the environment too. I’m fair skinned so sun protection is something I’m used to thinking about. When you go to Bryce Canon you’ll need to think about it whether you usually do or not. In the summer in Bryce Canyon it’s going to be hot during the day time (unless it’s winter) and there’s often little shade. Sun protection isn’t just sun cream. You’ll also need your hat from above, sunglasses and, ideally, some SPF rated lip balm. Suncream: is it weird to have a favourite sun cream because I totally do. I started wearing Sun Bum this past summer while out dog walking all day and I love the smell and how it feels. It makes me actually want to wear suncream rather than do it out of a need. This is one of your 10 essentials and you should always have a first aid kit when you hike. It doesn’t matter whether you’re overnighting or not. These first aid kits are super lightweight and have most of what you’ll need in them. I get eaten alive by mosquitoes and there’s nothing worse than having to constantly swat flies from your face or body. Add bug spray to your Bryce Canyon packing list. People always recommend bug sprays high in deet but personally, these don’t seem to work that well for me. The ones that work best for me are citronella scented bug sprays. They also smell a lot better! If you don’t want to use a bug spray that’s too chemically then you can get some great natural bug sprays such as these. Trust me, you’re going to want to take photos! This is the camera gear I use. You’ll need it at some point! You can buy a yearly pass at REI.com which I think it’s by far the best value if you plan on visiting a few, or the same National Park more than 3 times in one year. You can also buy a pass at the park gate but that’s $30 whereas this year pass is $80! This is by no means an essential but it will be fun. Bryce Canyon has super dark skies and if you stay at night you’ll be grateful for packing a star chart or added a star app to your phone. SkyView® have a free app for iPhone or Android, which Thom has on his phone. You simply move your phone around the sky and it’ll show you the constellations. I love it!